Achieve salon-worthy results on-the-move with Moroccanoil's Travel Essentials Hydrate Set; four of the brand's favourite haircare treats and a convenient zipped cosmetic bag. Perfect for cleansing, replenishing and styling locks no matter where you go. Gently cleanses and refreshes hair whilst restoring elasticity and vibrancy. Infused with Argan Oil, Red Algae and Vitamins A and E, the lightweight shampoo delivers replenishing nutrients to provide dull, tired hair with long-lasting moisture. Locks are left healthy, hydrated and thoroughly cleansed. A deeply nourishing, vitamin-rich formula that works to hydrate and revive strands from root to tip. Harnessing the powers of Argan Oil and Red Algae, it moisturises and rejuvenates, whilst protecting weak, tired hair from the damaging effects of environmental and chemical stresses. Achieve salon-worthy results from home with the frizz-fighting formula. Ideal for blow-drying and combating flyaways, the leave-in, non-greasy cream utilises nourishing Argan Oil to add shine and definition with soft, natural hold. Ideal for coarse, dry hair, or refreshing styles the next day. Harnessing the powers of antioxidant-rich Argan Oil and shine-enhancing vitamins, the nourishing formula helps to strengthen and fortify strands, whilst fighting frizz and effectively detangling for a salon-worthy finish. Expect calm, manageable locks with revived radiance and vitality. Suitable for fine or light-coloured hair. Shampoo: Massage the shampoo throughout wet hair and scalp, adding more water to activate a rich lather. Rinse thoroughly. Conditioner: Apply to cleansed, damp hair and massage into the mid-lengths and ends. Leave for 1-2 minutes, then rinse. For best results, use regularly. Cream: Apply to damp or dry hair from mid-length to ends. Blow-dry and style as usual or allow hair to dry naturally. This entry was posted in Hair Care, Rock the Weekend, Shampoos, Conditioners and tagged blow dry, coloured hair, conditioner, hair treatments, moisturising, moroccanoil, shampoo on 10th September 2018 by The Salon Look Girl. 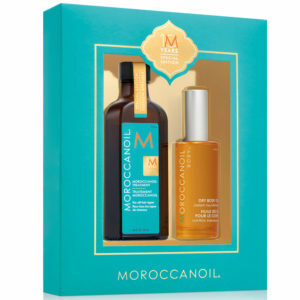 Treat your locks to the benefits of the Travel Essentials Repair Set from Moroccanoil. Housed in a zipped bag, the travel-sized products are perfect for cleansing, conditioning and styling on-the-go. Harnessing the powers of antioxidant-rich Argan Oil and shine-enhancing vitamins, the nourishing formula helps to strengthen and fortify strands, whilst fighting frizz and effectively detangling for a salon-worthy finish. Expect calm, manageable locks with revived radiance and vitality. Ideal for dry, damaged hair. This entry was posted in Hair Care, Rock the Weekend, Shampoos, Conditioners and tagged blow dry, conditioner, hair treatments, moroccanoil, shampoo on 10th September 2018 by The Salon Look Girl. This entry was posted in Hair Care and tagged advice, blow dry, coloured hair, conditioner, dry hair, dull hair, frizzy hair, hair treatments, hydrate, moisturising, moroccanoil, skincare on 10th September 2018 by The Salon Look Girl.